Taking sky brightness readings in Torrey during a September 2017 monitoring event. Photo ©️ Scott T. Smith. If an entire community could earn a gold star for good conduct, then the town of Torrey, Utah, has done just that. IDA awarded that star today by officially recognizing Torrey as Utah’s first International Dark Sky Community. Only 18 communities in the world have achieved this distinction. An IDA International Dark Sky Community is a town, city, municipality or other legally organized community that has shown exceptional dedication to the preservation of the night sky through the implementation and enforcement of a quality outdoor lighting ordinance, dark sky education and citizen support of dark skies. 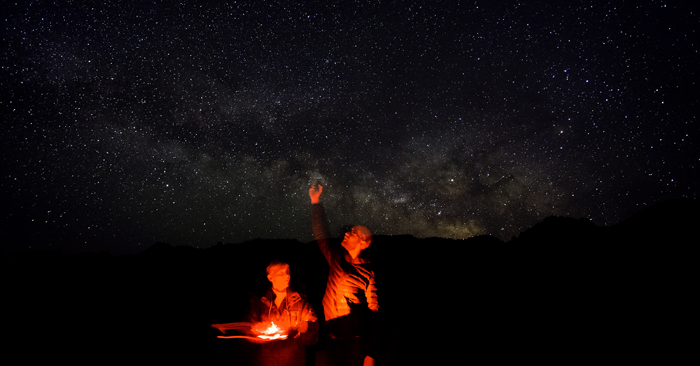 International Dark Sky Communities excel in their efforts to promote responsible lighting and dark sky stewardship, and set good examples for surrounding communities. Torrey is situated adjacent to Capitol Reef National Park, which was designated an IDA International Dark Sky Park in 2015. It is the first such U.S. national park ‘gateway community’ to earn the International Dark Sky Community designation. Torrey’s new status is therefore key to preserving abundant natural nighttime darkness in Capitol Reef. The stars began to align for Torrey when Capitol Reef was designated an International Dark Sky Park. This prompted Torrey residents, friends, and citizens from across Wayne County, Utah, to hitch their wagon to the International Dark Sky Park by working toward International Dark Sky Community status. In turn, the Torrey Town Council implemented an outdoor lighting ordinance, which requires street and building lighting to be shielded and directed toward the ground. In a partnership with the Torrey-based Entrada Institute, engaged citizens raised money to replace the town’s high-pressure sodium streetlights with dark sky-friendly, fully-shielded light-emitting diode (LED) lights. The success of this campaign, along with education events and publications, made it possible to bring darker skies and brighter dreams to Torrey. A unique group of leaders supported this effort: town council members, Torrey Town and Wayne County residents, local business owners and friends from across the country. Their enthusiasm and advocacy make it possible to preserve the stars for present and future generations. To maintain its International Dark Sky Community status, Torrey must continue to preserve its night sky through education and awareness materials, dark sky events, exhibits, and programs. An official celebration will be held in Torrey during the Heritage Star Festival on October 5 and 6, 2018. Previous post: With Your Support, the International Dark-Sky Association Will be Doing so Much More in 2018!